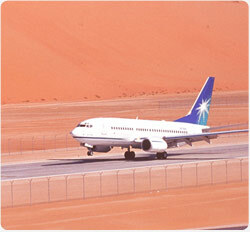 Both traditional and modern sports are popular in Saudi Arabia. The people of the Arabian Peninsula have enjoyed sports for thousands of years, including horse and camel racing, falconry and hunting with hounds. Today, modern sports are also popular – especially soccer. A special effort has been made to encourage sports and make them accessible to the public. Hundreds of facilities have been established throughout the Kingdom so that all Saudis can exercise regularly or enjoy popular spectator sports. In addition, all levels of the Saudi educational system – from kindergarten through university – emphasize the importance of sports. Soccer is by far the most popular modern sport in Saudi Arabia. Saudis of all ages have taken the game to heart, from children scrimmaging on playgrounds to international matches battled out in spectacular modern stadiums. There is a professional Saudi soccer league that is wildly popular among Saudis – friends and families often gather to cheer on their favorite teams, both on television and in stadiums. The highlight of the Saudi soccer league is its championship tournament known as the King’s Cup. Fans also avidly follow the Saudi Arabian national soccer team in World Cup competition. In addition to soccer, other organized sports have gained a following among Saudis, including volleyball, gymnastics, swimming and basketball. Saudi Arabia has a number of first-class golf courses. American expatriates introduced golf to Saudi Arabia in the late 1940s when they created a course in the sand near Dhahran. They mixed oil with the sand to keep the course from blowing away, a method that is still used in the Kingdom. Today, there are lush, green courses in that look like they belong in the tropics. The Kingdom has a number of different types of sports facilities, ranging from major sports complexes to neighborhood facilities and clubs. The huge sports complexes, called Sports Cities, are located in large population centers. Each complex has a stadium that can seat between 10,000 and 60,000 people, an indoor stadium seating 5,000, Olympic-size swimming pools, indoor and outdoor courts, playgrounds, conference halls, and sports medicine clinics. Smaller than the Sports Cities, neighborhood sports facilities and playgrounds were built in large urban areas so that young Saudis can play sports like basketball and volleyball near their homes. These centers offer parks, open spaces, and facilities for indoor activities. Local sports clubs are located in all cities and towns. They offer a range of facilities for different sports, including soccer fields, indoor and outdoor courts, swimming pools, playgrounds, recreational areas and accommodations for youth camps. These clubs organize local events throughout the year. The introduction of a national education system in the 1950s was the first step in the development of modern sports in Saudi Arabia. An integral part of the education system, sports spread throughout the country as new schools were built in large cities and small towns alike. The development of sports acquired momentum with the introduction of the First Development Plan (1970-74). At the time, a decision was made to establish a nationwide network of sports facilities that could be enjoyed and used by all. The plan called for the construction of sports and athletic facilities, the establishment of recreational programs and the creation of clubs for the Kingdom's youth. A further step in encouraging public participation in sporting activities was taken in 1974 with the establishment of the General Presidency of Youth Welfare (GPYW). Its mandate is to make sporting, recreational and cultural facilities and events accessible to young Saudis throughout the country and to get as many people interested and involved in these activities as possible. The presidency's activities complement those of the Ministry of Education, which is responsible for maintaining physical education programs within the school system, and the Ministry of Higher Education, which oversees sports programs at Saudi Arabia's universities and colleges. Today, schools, colleges and universities emphasize sports as an integral part of their curriculum. Outside the country's educational system, the GPYW is the primary provider of sports facilities and programs. With almost unlimited moral and material support from Saudi leaders, the GPYW has put into place a formidable sports structure and program that covers the entire country. Based on studies on population density and needs in various parts of the Kingdom, the GPYW initiated a three-tier program. The first provides for the establishment of huge sports complexes -- called Sports Cities -- in major population centers. These gigantic facilities are scattered throughout Saudi Arabia, and more are being built. Each has a multipurpose stadium with a seating capacity of between 10,000 and 60,000, a 5,000-seat indoor stadium, Olympic-size swimming pools, indoor and outdoor courts and playgrounds, cafeterias, halls for conferences and clinics for sports medicine. The second tier of the GPYW's sports program concentrates on establishing smaller neighborhood sports facilities and playgrounds in large urban centers where young Saudis can play basketball, volleyball and other sports near their homes. In addition to parks and open spaces, these centers also have buildings where indoor recreational activities can be arranged. The third tier focuses on making sports facilities available in smaller population centers by establishing Sports Clubs in all cities and towns. Although not as large as the Sports Cities, these clubs meet the needs of residents of towns and villages. Differing in size according to the number of residents of the town, the clubs offer a range of facilities for different sports, including soccer fields, indoor and outdoor courts, swimming pools, playgrounds, recreational areas and accommodations for youth camps. Sports training programs in a diverse range of fields from archery to soccer are available to Saudis of every age at the country's sports facilities, large and small. Though open to all, they are intended to introduce young Saudis to various sporting activities and offer training at different levels. In addition to building sports facilities, the GPYW has also introduced programs to encourage their use by the general public. To achieve that objective, it has introduced a program of annual events on the local and national levels at all its facilities. These include competition in local leagues, 'Sports for All' gatherings and 'Folk Games Days'. GPYW sports clubs organize neighborhood and local sporting events throughout the year. The more accomplished athletes are sent by these clubs to participate in the 200 or so annual district and national sports events organized by the GPYW. Athletes who excel at these events are enrolled in special training camps for serious local and national competition. Twenty youth sports camps throughout the country host thousands of young Saudis every year. Equipped with modern sleeping, dining, sports and recreational facilities, they offer sports training in an atmosphere that emphasizes Saudi Arabia's heritage. The best young athletes emerging from these programs are then selected for intensive training to represent Saudi Arabia in international events. The Kingdom's 18 sports federations, which are supervised by the GPYW, organize leagues and tournaments for these athletes to sharpen their skills. Additionally, athletes and teams attend more than 40 sporting events outside the country each year and participate in major international sporting events inside the Kingdom. Saudis enjoy a wide range of leisure activities. Families can relax at hundreds of parks, campsites, picnic grounds and other facilities throughout the country. Long stretches of coast and spectacular coral reefs make water sports such as snorkeling and wind surfing easily accessible. In addition, the Kingdom has established a network of national parks and preserves so that visitors can observe protected wildlife and ecosystems. 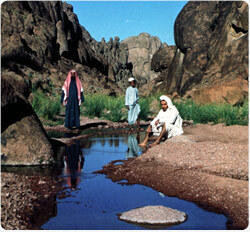 The crown jewel of Saudi Arabia’s national parks system is the 1.1 million acre Asir National Park. Visitors can hike, camp, climb hills and other outdoor activities in this cool, green paradise. The Kingdom’s largest preserve is Al-Khunfah, where visitors can take in spectacular views and observe wildlife such as gazelles and oryx in their natural habitat. In the cities, people can relax in hundreds of urban parks. Riyadh alone – which means “garden” in Arabic – has 50 public parks. The waterfront corniches of Jeddah and Dammam are also popular places for picnics, swimming, fishing and other watersports. Camping is a popular activity among Saudis. Families pitch tents in the middle of the desert, along the coast or in one of the Kingdom’s parks, and enjoy the beauty of nature. These camping trips are popular during the Eid holidays and for family reunions, especially after the rainy season when the desert blooms. Saudi Arabia is home to a variety of animals include the Arabian Oryx, a type of antelope native to the Arabian Peninsula that roams freely in Saudi Arabia’s large desert. Other animals found in the Kingdom include marine life, gazelles, the ibex (a type of wild mountain goat) the bustard, and the swift saluki hound, a type of dog named for an ancient city in southern Arabia. The saluki is generally considered to be the world’s oldest domesticated dog. The famous purebred Arabian horse is one of the most popular breeds in the world, with a bloodline that dates back thousands of years. The Arabian's fine shape and extraordinary stamina and speed make it ideal for racing and breeding. There are also many camels in Saudi Arabia. They have been used as a means of transportation for thousands of years. Today, camel racing is a popular sport. Saudi Arabia has taken major steps to preserve its native wild and marine life and established preserves both on land and in the ocean off the Saudi coast. Saudi Arabia's extensive sports program has brought about not only a quantitative growth of sports, but also a dramatic qualitative improvement. The performance of Saudi athletes has improved steadily since the Kingdom joined the International Olympic Committee in 1965. 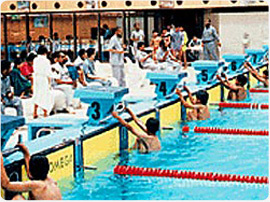 Since the early 1980s, Saudi athletes have proudly represented the Kingdom in an increasing number of regional and international competitions. 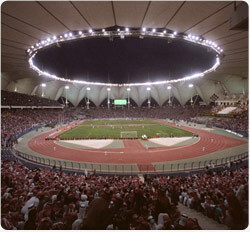 The Saudi soccer team qualified for its first appearance in 1984 Olympics in Los Angeles. In 1989, Saudi Arabia hosted the fifth World Youth Soccer Cup Championship, won the championship, and received a special commendation from FIFA, the international soccer federation, for the outstanding manner in which it has organized the event. 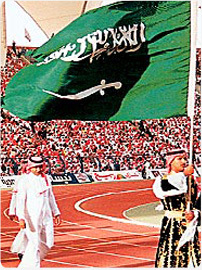 In 1994, the Saudi national soccer team represented Asia at the World Cup finals in the United States, reached the second round, and received accolades for their playing. Saudi Arabia continues to participate in the World Cup every four years. The Kingdom also participated in the 1996 Olympics in Atlanta, and the 2000 Olympics in Sydney, Australia, with competitors in the equestrian, wrestling, and track and field events as well as in soccer. In 2006, Saudi Arabia won the Learning Disability World Cup for soccer in Leverkusen, Germany. Saudi Arabia is also home to several Little League baseball teams, one of which has qualified over a dozen times for the Little League Baseball World Series in Williamsport, Pennsylvania. Saudi Arabia offers both natural and historical wonders, from the mountain resorts of Taif and the majesty of ancient Nabatean tombs to the multicolored coral reefs of the RedSea. While Saudi Arabia has been a travel destination for centuries, with millions of people visiting the Kingdom each year from around the world, most visitors have historically been Muslims undertaking pilgrimages. Today there is a new emphasis on tourism in Saudi Arabia, and in 2000, the Saudi Commission for Tourism and National Heritage was established to promote tourism in the Kingdom. Saudi Arabia’s capital city, Riyadh, is the geographic and cultural hub of the country and its largest city. Once surrounded by mud-brick walls, modern Riyadh – whose name comes from the Arabic word for garden (rowdhah) – is a contemporary city with an ever-expanding network of modern roads, high rises, residential suburbs and industrial parks. Despite being a modern city, Riyadh also retains much of its traditional appeal. The city’s historic Qasr Al-Hokm district has been carefully preserved and renovated to make it the city’s cultural, commercial and social center. One of the highlights of Qasr Al-Hokm is the historic Masmak fortress, which King Abdulaziz recaptured the fortress in 1902 – setting the stage for the foundation of the modern Kingdom of Saudi Arabia. Another highlight is the Murabba’ Palace, a former home of King Abdulaziz that has been renovated as part of the King Abdulaziz Historical Center in Riyadh. Twenty miles outside Riyadh lies the walled city of Diriyah, the ancestral home of the Al-Saud family and the first capital of the Saudi state. The Kingdom’s second largest city, Jeddah is a sparkling, modern commercial center that is considered one of Saudi Arabia’s most vibrant cities. It is alive with more than 300 gardens, and is home to one of the world’s tallest fountains. One of Jeddah’s loveliest features is the Corniche, promenades that extend miles along the Red Sea, interspersed with parks, fountains, lakes and kiosks. Its coastal location near the spectacular Red Sea coral reefs makes it a popular spot for water sports. The city also has a number of beautifully restored historical buildings, including the Naseef House (Bayt Naseef), with more than 100 rooms and a broad staircase to allow camels access to the first floor for unloading. Jeddah is Saudi Arabia’s main Red Sea port. For centuries, its large harbor has handled ships carrying cargo to ports throughout the world, as well as vessels bringing pilgrims to the Hajj. The capital of the Eastern Province, Dammam – along with nearby Dhahran and Khobar – is an important hub for shipping, oil, commerce and industry, and the home of the national oil company, Saudi Aramco. It was in Dhahran in 1936 that the famous Dammam No. 7 oil well was discovered, proving beyond doubt that the Kingdom was sitting on vast oil fields. Dammam is linked to Bahrain via the King Fahd Causeway, an engineering masterpiece that stretches 15.5 miles across the sea and reclaimed land. Located in the southwestern part of the Kingdom, Asir Province is an extensive region of steep mountains, lush greenery and cool breezes. The picturesque regional capital, Abha, is noted for its brightly colored mud houses, built in the traditional style. Residents paint their homes each year, usually in preparation for the Eids, the religious holidays that follow Ramadan or the Hajj. The Asir National Park, which covers 1.1 million acres, is a paradise for botanists, zoologists and ornithologists who come to study indigenous plants and wildlife. New varieties and species are still being discovered there. 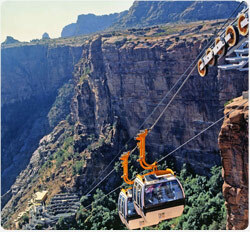 The mountain resort city of Taif is located 5,600 feet above sea level in the southwest region of Saudi Arabia. Its pleasant climate, lush parks, sunny skies and exotic wildlife have long drawn Saudi families to this resort town each summer. Its largest and most famous public garden is the King Fahd Park, which includes a lake, playgrounds, walking paths, and a mosque. Visitors can also take in the Shubra Palace, the former summer residence of King Abdulaziz and the most famous historical building in the city. Shoppers in Taif can browse its traditional souq for handcrafts, gold, silver, spices, perfumes and other trinkets. The holy city of Makkah is the birthplace of the Prophet Muhammad. Millions of pilgrims from around the world visit Makkah each year to perform the Hajj, the pilgrimage that is the religious high point of a Muslim’s life. The Holy Mosque in Makkah houses Islam’s most sacred shrine, the Ka’abah, to which Muslims around the world turn in prayer five times a day. Muslims are drawn to Madinah not as a religious duty as with Makkah, but out of love and respect for God’s last Prophet, who established the first Islamic community there. Madinah is also where the Prophet Muhammad spent the last years of his life, and where he and many of his companions are buried. The city is home to the Prophet’s Mosque. Both Makkah and Madinah are open only to Muslim visitors. In the ancient trading center of Najran, the capital of Najran Province, old and new buildings stand side by side, giving the oasis city a special charm. Visitors to Najran can enjoy several museums, including the ruins of the Al-Ukhdood settlement, a former commercial center that thrived from 500 BC through the 10th century. The Al-An Palace, a former governor’s residence, is a remarkable example of local architecture with its circular towers with white ramparts. Najran’s souq is well known for its traditional crafts such as colorful baskets, leather products and old Bedouin silver jewelry. Also of interest is the Al-Madik Dam in Najran Province, the second largest dam in Saudi Arabia. The dam has become a tourist attraction with parks at each end and wide variety of palms, flowering shrubs and citrus trees. The historic oasis of Hail, with its expansive boulevards, parks, playgrounds and refreshing climate, regularly draws large numbers of Saudi families. In ancient times, Hail was a stopping point along the famous Darb Zubaydah caravan route stretching from Mesopotamia, Persia and Central Asia to Makkah and Madinah. Built 12 centuries ago and named after the wife of the Abbasid Caliph Harun Al-Rashid (763-809), the caravan route included hundreds of wells and cisterns. Remnants of these can still be seen in Hail today. Located in the northern part of Saudi Arabia, Al-Jouf is famous for its ancient ruins, which show evidence of the presence of Assyrians and Nabateans in the region. The region was an important crossroads for traders heading into the Arabian Peninsula from Iraq and Syria. Al-Jouf also has a special significance in Islamic history. Following its conquest by Muslims in the third year of the Hijra (the migration of the Prophet Muhammad from Makkah to Madinah in 622 AD), Al-Jouf became a staging post for Muslim armies setting out to spread the message of Islam. Horse racing was, and remains today, one of the most popular sporting events in Saudi Arabia. There are modern racetracks in the Kingdom, although betting is prohibited. Locals have for centuries bred horses for racing and transportation. The famous Arabian horse has a bloodline that dates back thousands of years, and is one of the world’s most sought-after breeds. Camel racing is also a popular traditional sport. Traditionally the desert sport of Bedouins, camel racing is a major spectacle. In the past, races involved thousands of camels speeding across the open desert. Today, the rules have been modified for modern racetracks, and camel races are held every Monday during the winter at Riyadh Stadium. Other traditional sports include hunting with hounds and falconry. The swift saluki hound, named for an ancient city in southern Arabia, is generally considered by historians to be the world’s oldest domesticated dog. Falconry in the Kingdom today is limited and carefully regulated in order to protect the game fowl that is the falcon’s traditional prey. Some of the world's most beautiful living coral reefs are located beneath both the Red Sea and the Arabian Gulf. A paradise for scuba divers and snorkelers, these coastal areas offer endless hours of underwater exploration. 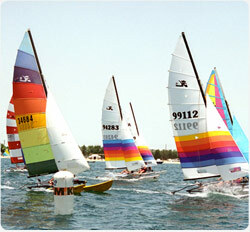 Wind surfing, sailing and water skiing are also popular pastimes in the Gulf and Red Sea waters along the Saudi coast. Also, some of the world's best deep-sea fishing can be found in the Red Sea. The Coastal Sports Cities in Jeddah and Al-Khobar and other clubs offer opportunities for a variety of water sports and recreational activities.